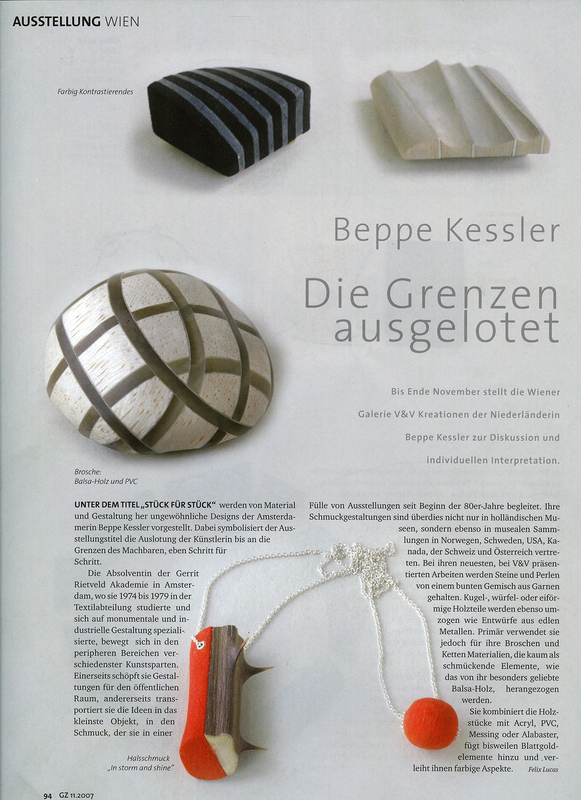 Two books, beppe kessler and kessler beppe were published in 2010, in a limited edition of 400 (paintings) and 600 (jewelry) copies. They are held together by a cardboard strip. Designed by Reynoud Homan and printed by Lenoirschuring. The texts are written by Anneke Oele and Liesbeth den Besten. Artist signature and copy number are handwritten on the cover. The new artist book of Beppe Kessler, on the way, shows a selection of the jewellery pieces she made since 2010. The dutch poet K.Schippers wrote, inspired by the work, a long poem for the book. (English/NL). Each book is unique because BK made small saw-incisions, the same way she works in her jewellery. It is an edition of 500 copies, numbered and signed. The (black) book zinnespelen was published in 1992, in a limited edition of 500 numbered copies. Printed by Rosbeek. The text is written, among others, by Marjan Unger. Each book is unique: the cover features a frame (5 x 5 cm) behind which a one-of-a-kind piece of textile or painted paper is attached. The book has been bound with 5 different kind of endpapers. The book contains objects, jewellery and interior fabrics. The (white) book beppe kessler was published in 1996, in a limited edition of 500 numbered copies. Printed by Rosbeek. The text is written by Michaja Langelaan. Each book has a unique cover, as the book binding differs from version to version. The linen cover features the artist’s signature and the copy number, handwritten. Underneath the linen fabric, little objects are hidden. The book contains paintings and jewellery. It has been nominated for the best Dutch book designs. The book de omkering / inversions was published in 2003 in a limited edition of 500 numbered copies. Designed by Reynoud Homan together with beppe kessler (outside). Printed by Rosbeek. The text is written by Gert Staal. There are 2 different versions of the cover. One with a photograph of the hand of the artist (front) and her father (back). The other version with the hand of her husband (front) and her mother (back). The book was, in this way, dedicated to husband and both parents. Each cover features embroidery on top of the photograph. Artist’s signature and the copy number are handwritten on the front cover. The book contains paintings, a carpet and jewellery. It has been nominated for the best Dutch book designs. A few copies of this edition are still available.